I’ve already shared with you my recipe for homemade laundry detergent. So how about fabric softener? Let’s take a step away from expensive chemicals and move into the pleasant world of cheap and natural. Today’s experiment: Fabric Softener Substitute. You are not going to believe this. White vinegar is a fabric softener. There it is. I spilled the beans. White vinegar is made by fermenting water and raisins a next step past being alcoholic. (No, I haven’t made it myself yet, but someday I will!). White vinegar is a natural disinfectant. Using white vinegar in your laundry will soften your fabrics and will also disinfect it. Bonus! In a normal load of clothing, I add two tablespoons of white vinegar to the fabric softener dispenser. That’s it. Two tablespoons, People. If it’s a really big load, like a bunch of towels, I double it, adding 1/4 cup. That is seriously all you need for soft fabrics. But you say, the laundry detergent doesn’t have a perfumed odor. The white vinegar definitely isn’t perfumed. What if I really, really like the perfumed smell of freshly dried laundry? Ask no more, Friends. I have the solution. Take an old sock or rag that you aren’t using. Put six drops of an essential oil onto the rag. Throw it in the dryer with your wet clothing. Voila! Out comes smelly good dried clothing. You shouldn’t add the essential oils in with the laundry because some essential oils can break down the fibers of the cloth over time. That’s also why it’s best to use an old sock or rag, not something that you’re going to want to use later. So now my family buys a gallon-sized white vinegar. We hardly ever use it for food, but always use it for our laundry. If you were to use two tablespoons per load, one gallon would last you 128 loads. At Wal-Mart, a gallon of white vinegar costs $2.78. A gallon of store brand fabric softener that lasts for 60 loads costs $3.78. You are spending 2 cents a load when you use white vinegar. With the fabric softener, you’re spending 6 cents a load. The savings are tangible. Using the essential oils to add smell can get pricey, depending on your scent of choice. To be honest, we don’t use it. The laundry smells fresh and we don’t miss having a scent. On a side note, we use an old white vinegar bottle to store our homemade laundry detergent. More on the wonderful uses of vinegar later. Have any of you out there ever made your own vinegar? Does anyone already use these fabric softener substitutes? I have been using vinegar for a fabric softener for over a year. I love it and save tons of money using it. I buy mine by the gallon at shoprite for $1.79. Tank you! I can’t wait to try this out!!! I use apple cider vinegar for conditioner. I love it so much! I will never use a traditional conditioner again! And now thanks to you, I will not likely ever buy another bottle of fabric softner!!! A vinegar rinse is wonderful for your hair as well. It will remove all traces of chemicals left by shampoo, pool chlorine. I warm it up slightly in the microwave (you don’t have to do this, I just think it feels better on my head if it’s warmish). I pour it over my head last thing before I get out of the shower, brisk it in, and quick rinse it out. Leaves your hair naturally shiny and doesn’t harm it the way harsh chemicals can. vinegar IS a great softener. i have used it. I would continue to do so, if i knew what to do to stop the static cling. ( Besides use the Static Guard spray once i am dressed)Ideas ? I use vinger for everyday cleaning….. I keep a spray bottle next to my sink beside cleaning I use it for cleaning fruits and veggies. Also pour it in my dish washer where the jet dry go’s …. Wonderful product !! We have used it for years. As a kid, I was allergic to the chemicals used by the detergent company to make it smell nice, so we had to use vinegar in the rinse to get all that stuff out of my clothes so I could wear them! It is a brilliant softener, and everything smells fresh too, not vinegary! 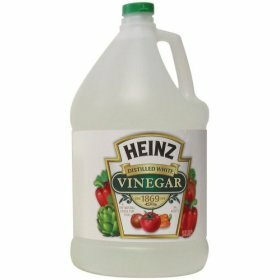 Do any of you who use vinegar use it in a HE washer? Thank you for the tip. That will save me lots of money and at the same time I like the disinfectant. White vinegar is great for a sore throat. Gargle with it and the sore throat goes away. It just takes your breath so do it slowly. I’ve been using vinegar in my laundry for a long time. Didn’t know the trick about essential oils on an old rag/sock though! Going to have to try it! Lois, I don’t have an HE washer. Does anyone else on here? Laura, here’s my motivation: http://www.samplestuff.com/?p=2092 The means are checking out books at the library, asking other people what they do, pursuing other blogs, and endless internet searches. Did anyone find out if it is safe for HE washers??? What about the static cling? Does it fix that as well? That’s the main reason I buy fabric softener. I use white vinegar mostly for cleaning the hard water build up off of the faucets & shower head. Soak a rag or cotton balls, place on build up and let sit for about 30 minutes depending on how bad it is, comes off with ease with out harsh chemicals and won’t tarnish the fixtures. I am also curious about using it with an HE washer. Please, if anyone has done this, was it safe to use? I want to try using vinegar in my wash, but I don’t want to ruin my washer. I can’t see how it could hurt, but you never know. I haven’t tried vinegar for softening but I do have a hint: For years I’ve been cutting softener sheets in half, but a while ago I had only one sheet left so I cut it in quarters. Guess what! It worked just as well so now I use a quarter sheet for mosr dryer loads. Thanks again Naomi for another great idea!! It is wonderful how you encourage us to save money. Keep up the good work!! I am trying the vinegar in my HE washer now…. i don’t see how it can hurt when i have to put 1 cup of bleach in it after 50 washes to clean the machine out and keep it from having that mildew smell. Bleach is stronger than vinegar,. I don’t use fabric softener. That is $0/load. Naomi do you use dryer sheets? No, I don’t. I haven’t had a big problem with static though. What’s your recipe for raisin white vinegar, please? I don’t know who told you that white vinegar was made with fermenting water with raisins… Read the ingredients on the bottle… it’s made from corn.